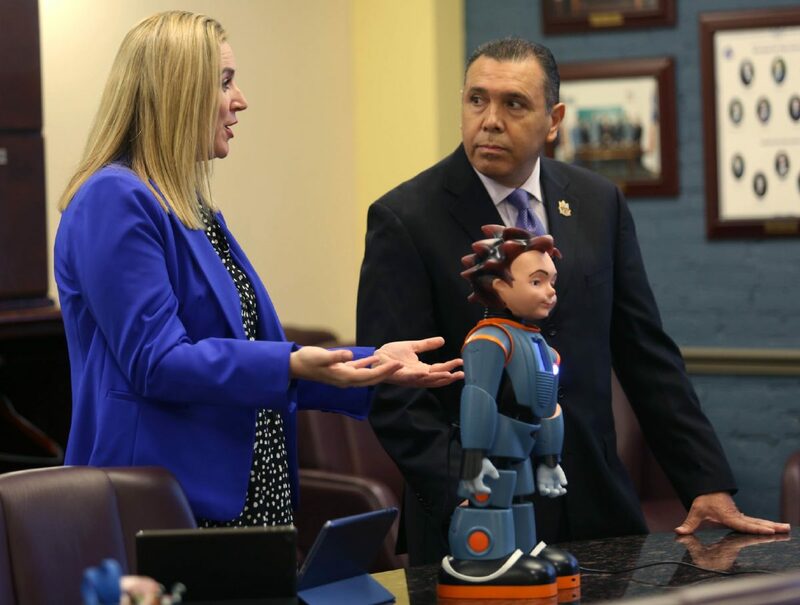 Gwynn Gunter, of RobotKind, talks about the use of robots to help children with autism learn as Edinburg CISD Superintendent René Gutiérrez stands with her during a news conference Tuesday, April 10, 2018, in Edinburg. EDINBURG — Sporting a doe-eyed, doll-like face with spiky hair and a cartoonish armor-enforced body, Milo the robot will soon be Edinburg school district’s latest addition to classrooms. Milo, by RoboKind, a Dallas-based company, comes with curriculum that starts by addressing calming techniques and over time targets behavior, emotional understanding, and vocabulary and interaction skills. The robot is intended to help children on the autism spectrum better associate facial expressions and some movements with social behaviors and emotional queues. Milo’s face can display expressions such as surprise, happiness and even annoyance, while its body can also walk, move its arms and even do what it calls a monkey dance. 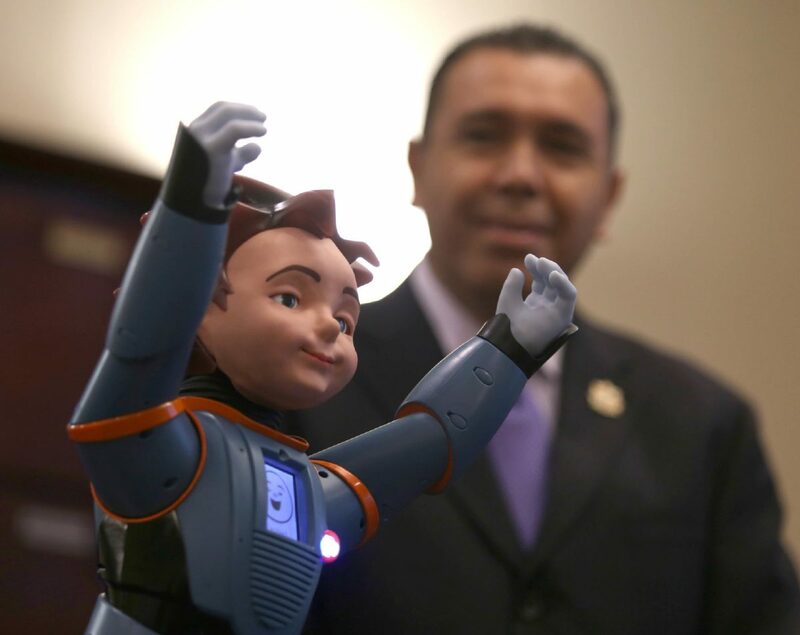 Milo, a robot designed to help children with Autism, raises his hands as Edinburg Consolidated Independent School District Superintendent René Gutiérrez stands beside it during a news conference Tuesday, April 10, 2018, in Edinburg. Using an iPad or tablet, the teacher can select lessons to be delivered through Milo and while one-on-one sessions are recommended. These can first be introduced in a group setting, if needed, considering repetition is a huge factor when using the robot. Its language is delivered at what product experts say is 20 percent slower than regular speech, and a screen on the chest of the robot queue the student to make eye contact and listen with images that appear periodically. And while this robot is not bilingual yet, Gunter said the slower speech could also help English language learners with their vocabulary. Edinburg school district is the first in the Rio Grande Valley to acquire the robots and the largest implementation of it so far, Gunter said, and they are working to advertise the benefits of the technology in other districts in the area. Milo went into the market three years ago and is now in 26 school districts across the state, she said. For the pilot program, Edinburg school district will first introduce the robot at six elementary schools —Crawford, Eisenhower, Flores-Zapata, Jefferson, LBJ and Ramirez. Each of these elementary campuses will get one robot to test in one classroom, which Edinburg school district Superintendent René Gutiérrez estimates will impact more than 40 students. The school district paid about $10,000 per robot for the pilot, which includes the curriculum and training. Teachers are scheduled to receive training this month on how to best deliver lessons using Milo and begin using the robot in May for the end of the school year and maybe even a summer program, Gutierrez said. District officials will then evaluate the feedback from teachers, students, parents, as well as the student’s achievements to move forward with an expansion, which Gutiérrez said they are already anticipating. But even if this technology becomes available in more classrooms, one thing that both Gunter and Gutiérrez pointed out was that this is not intended to replace teachers but to assist them with students that might not react to regular lessons.